In 2008 a group of girls hockey enthusiasts knew that girls could continue to play local association and high school hockey yet also access select hockey via winter and spring jamboree and tournament events. This need to support local association and scholastic high school hockey girls hockey in VT and Upstate NY is critical because (1) local U10, U12 and U14 teams serve as our best grow the game vehicle, and (2) the local and high school teams need our players to lead their teams and help maintain their programming. 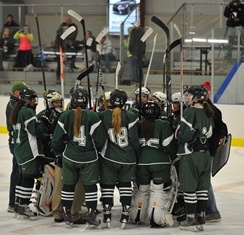 The once vibrant culture of girls hockey in Vermont could be at risk if players and parents do not continue to grow the game. The only way kids start playing hockey is if there are teams for them to play on! In 2011 we added Boys AAA spring teams to our program. As an aside, all of our teams are very competitive. We rely on local associations to develop players and we maintain our partnership with the locals (1) not running national bound teams in the U12 and U14 age groups, and (2) by requiring that our winter players are rostered on local association/scholastic teams. Our U16 and U19 teams are split season national bound teams.